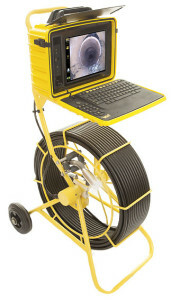 CCTV Drainage Surveys in Dorset and Southern England. Complete Drainage Services provide a full range of professional and comprehensive CCTV camera surveys of drains and sewer systems of all shapes and sizes across London and Southern England. From basic ‘look and see’ camera inspections to complete in depth recorded surveys of entire pipe work networks with thorough reports and recommendations, we can help. CCTV inspections and surveys are the most effective and least damaging and low cost way to discover the root cause of a blockage or damaged drain. No initial excavations or ground work is needed to establish the best course of action to repair and re-establish your drains to perfect working order. Not only are our Drainage surveys required for repairs to existing property owners they are now a highly recommended and valuable investment when buying a home or commercial building. Buying a property is very expensive but the price you pay for the building is only part of the story. After including all of the additional expenses such as legal fees and stamp duty the amount becomes somewhat higher. With this in mind it’s important to know that the biggest purchase of your entire life is a wise one, therefore a survey of both the structure and also the drainage and underground ‘unseen’ aspect of the building is now a very good idea. With ever increasing and changing disclaimers, responsibility legislation amongst the current compensation culture a thorough understanding of the drainage system of your property is somewhat essential for any eventualities and avoidance of nasty surprises. We are able to provide complete home buyer domestic and commercial surveys containing fully comprehensive drainage system CCTV DVD recordings, highlighting any defects within the system. A full report with still images of highlighted defects and potential problems along with CAD created technical drawings mapping the layout of the property’s drainage. We can then provide a quotation and suitable assessment of how to rectify any problems shown within the survey. Very pleased. Would highly recommend! Blocked toilet caused by wipes. Excellent Service. Very polite engineer. Brilliant. Was kept informed throughout. Very professional from start to finish.